The AnDY RAG is a group of young people who have personal experience of anxiety or depression, or who have cared for someone who has. 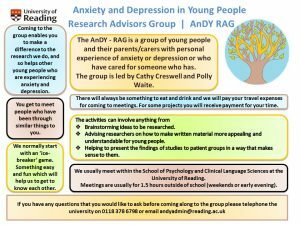 The AnDY RAG work with researchers and clinicians at the University of Reading to make sure they do research that will be helpful for children and young people with anxiety or depression and their families to make sure it is done in a way that families will find acceptable and interesting. When we meet we normally start with an ‘ice-breaker’ game. Something easy and fun which will help us to get to know each other. We often do this jointly with the parents and carers who attend. Then we work with the researchers to helping them with research projects. We often break up in to separate groups of parents/carers and young people at this point. The activities can involve anything from brainstorming ideas that to be researched, advising researchers on how to make written materials appealing and understandable for young people, or helping to present the findings of studies to patient groups in a way that makes sense to them. Do I get anything for coming? There will always be something to eat and drink and we will pay your travel expenses for coming to meetings. For some projects you will receive payment for your time. From time to time we organise social events for the group if you would like to come along to these. Why would I want to come along? Coming to the group enables you to make a difference to the research we do, and so helps other young people who are experiencing anxiety and depression. It will also provide you with the skills that you can use in your future. Being part of this group can be added to your CV and mayhelp you when you are applying for a job or for further training. We are able to provide a reference about your work with the group if you would like us to. Who leads the AnDY group? Catherine Newell, who is the Research Advisors Group Facilitator. Cathy Creswell, who specialises in research with young people who have anxiety. Polly Waite, who also works at the university researching anxiety disorders in adolescence. We usually meet within the School of psychology and Clinical Language Sciences at the University of Reading. Researchers are also keen to hear from those of you who may prefer to work on a one to one basis with them. Maybe you are not that comfortable in a group, or perhaps you would love to be involved but can’t the times we meet? If this is you then do get in touch and we can talk with you about other ways that you can get involved – whether over the phone, online or face to face. We hope this information is helpful. If you have any questions that you would like to ask before coming along to the group please telephone the university on 0118 378 6798.